When I was putting together my Current Skincare video a few months back, I realized that while my routine serves me well enough, it's not exactly mind-blowing. Due to my past skin issues, I've erred on the side of the safety by not straying far from my known and trusted products. While this has resulted in relatively good skin, I can't help feeling like I'm missing out on fabulous skin due to my less than experimental approach to skincare. 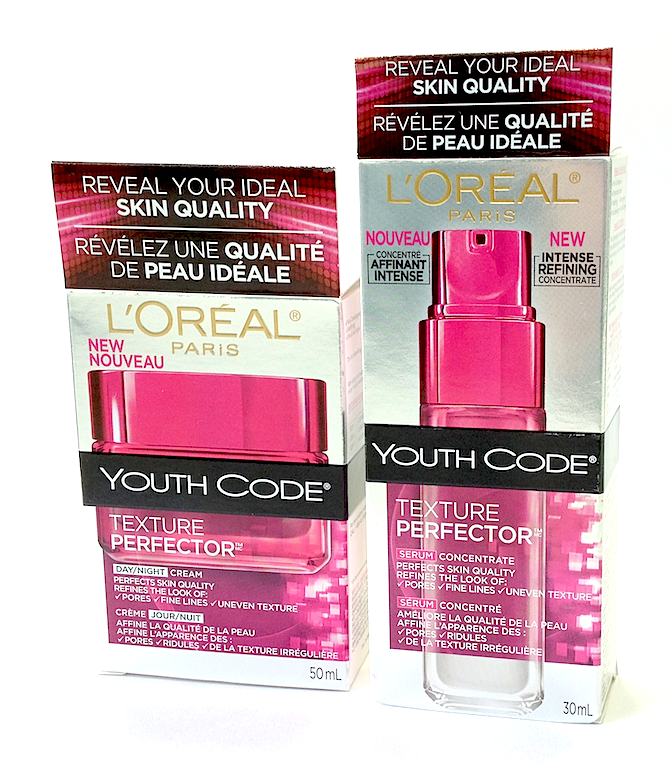 One of the first things I had a chance to try out is this duo from L'Oréal: the Youth Code Texture Perfector Serum Concentrate and the Youth Code Texture Perfector Day/Night Cream. These products are part of the Youth Code range, which aims to address textural issues: pores, fine lines, unevenness. The Serum Concentrate contains LR2412, which is supposed to aid the skin in its self-renewal process, and Perline-P, which is supposed to help the pores remain clear of accumulated cells and tighten the skin's elasticity. It contains: Aqua/Water, Cyclohexasiloxane, Glycerin, Alcohol Denat., Sodium Tetrahydrojasmonate, PPG-15 Stearyl Ether, Dimethicone, BIS-PEG/PPG-16/16 PEG/PPG-16/16 Dimethicone, Polysilicone-11, Dipropylene Glycol, Polymethyl Methacrylate, Ammonium Polyacryldimethyl Tauramide/Ammonium Polyacryloyldimethyl Taurate, Hydroxyethylpiperazine Ethane Sulfonic Acid, Eperua Falcata Bark Extract, Dimethiconol, Sodium Hyaluronate, Inulin Lauryl Carbamate, Adenosine, Poloxamer 338, Disodium EDTA, Hydroxyethylcellulose, Caprylic/Capric Triglyceride, Lens Esculenta Seed Extract/Lentil Seed Extract, Xanthan Gum, Dextrin, Phenoxyethanol, CI 77891/Titanium Dioxide, Mica, Linalool, Alpha-Isomethyl Ionone, Limonene, Citronellol, Parfum/Fragrance. F.I.L #B55667/1. The Day/Night Cream is similarly supposed to boost skin's natural regeneration, refine the look the fine lines and pores, and generally improve overall skin quality. It contains: Aqua/Water, Dimethicone, Glycerin, Isopropyl Isostearate, Pentaerythrityl Tetraethylhexanoate, Octyldodecanol, Cetyl Alcohol, Silica, Behenyl Alcohol, Talc, PTFE, Polyethylene, Eperua Falcata Bark Extract, PEG-100 Stearate, Stearic Acid, Stearyl Alcohol, Carbomer, Arachidyl Alcohol, Dimethicone/Vinyl Dimethicone Crosspolymer, Cetearyl Alcohol, Cetearyl Glucoside, Sodium Hyaluronate, Sodium Hydroxide, Palmitic Acid, Adenosine, Poloxamer 338, Ammonium Polyacryldimethyltauramide/Ammonium Polyacryloyldimethyl Taurate, Disodium EDTA, Capryloyl Salicylic Acid, Caprylyl Glycol, Lens Esculenta Seed Extract/Lentil Seed Extract, Dextrin, Phenoxyethanol, CI 16035/Red, CI 17200/Red 33, Linalool, Alpha-Isomethyl Ionone, Limonene, Citral, Citronellol, Parfum/Fragrance. F.I.L #B159063/1. I have to say that on a superficial level, I just love the packaging! I am a pink girl through and through, so the fuchsia containers delighted me. It's fun, youthful and feminine, which makes sense considering the demographic this line is aimed at - ladies in their 20s and early thirties who are taking skincare more seriously and looking to address those first signs of aging. As cute as the packaging is, it's what's inside these jars that really counts. The serum has some wonderful and beneficial ingredients. Eperua Falcata Bark Extract and Adenosine are anti-inflammatory, so can potentially help with redness and irritation. Sodium Hyaluronate and Glycerine are excellent humectants, and will plump up the skin (and fine lines!) with their moisture-retention. The Lentil Seed Extract is what helps refine the texture of pores, reducing their dilated appearance. The silicones present will also smooth the appearance of texture in the skin. All kinds of good stuff! The downside, ingredient-wise, is the prominent listing of alcohol, which can be drying and irritating. It always baffles me when I see it in serums and moisturizers, especially when they are otherwise full of awesomeness. The cream has many of the same beneficial ingredients as the serum, with more emollients for hydration and salicylic acid for some exfoliation. It's hard to tell how much exfoliation without a percentage or PH level, but I suspect it's one of the ingredients that helps to reduce the look of dilated pores. 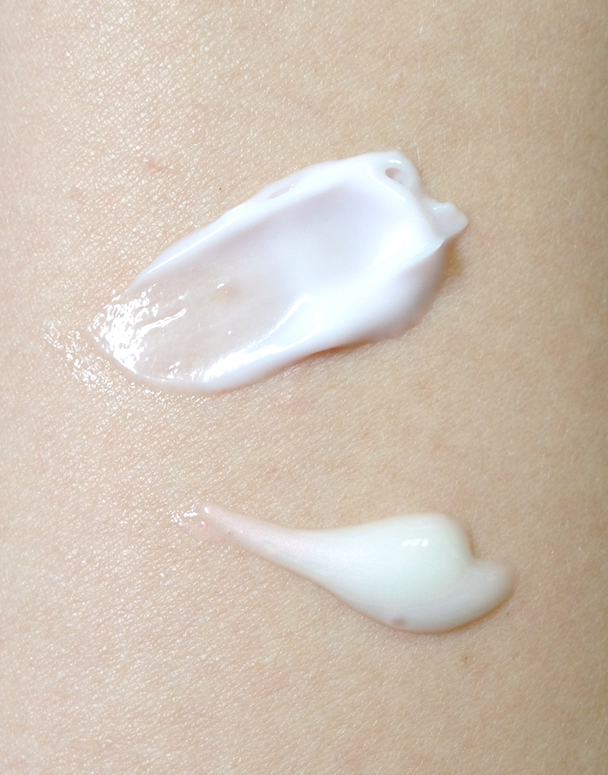 What's interesting about this cream is that it also contains a fair bit of silica and talc, which creates a slightly mattifying effect while the other ingredients are doing their hydrating and refining. I didn't find the matte finish to be long-lasting, so if you have serious oiliness you will still need whatever product you use for that. 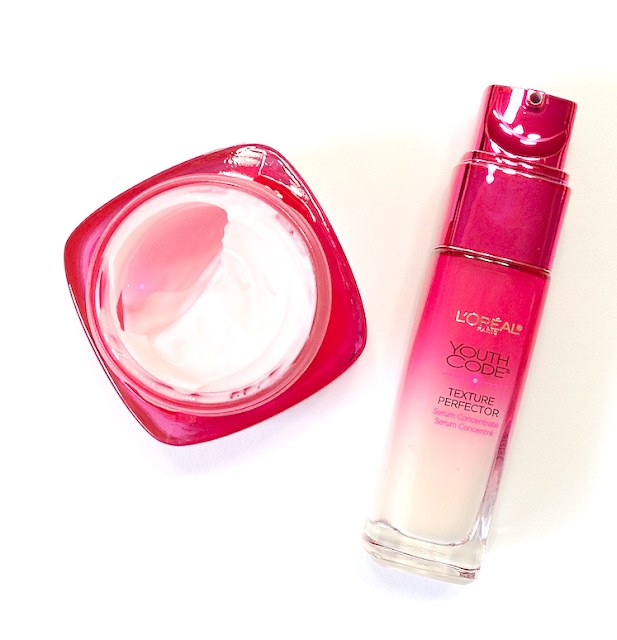 It's a good finish for skin types that need a moisturizer but find most to look too greasy on them. Both of these have a light fragrance. It's pretty and I enjoy it, but just be aware if you're sensitive to such things. Availability: Currently out in most drugstores, including Pharmaprix/Shoppers Drug Mart. Price for each item is 29.99$ CAD, 24.99$ USD.